The countdown timer at CompleteThePattern.com ran all the way down (again), and it appeared that there was no change to site. However, the entrance to "Phase 2" was found, thanks to FringedOutChris and Chris Lynn. 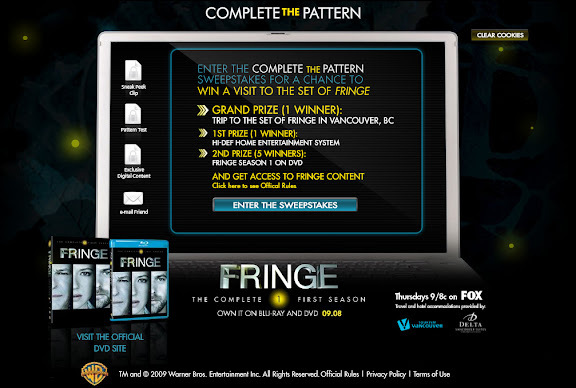 By surfing directly to CompleteThePattern.com/Phase2, you are taken to the new content, which includes a behind-the-scenes clip from the Fringe Season 1 Blu-ray And DVDs, downloadable wallpapers and themes, and a chance to win a trip to the Fringe set in Vancouver and other great prizes. Warning: According to the official rules, the contest does not officially start until Monday, August 24th - so enter early at your own risk. 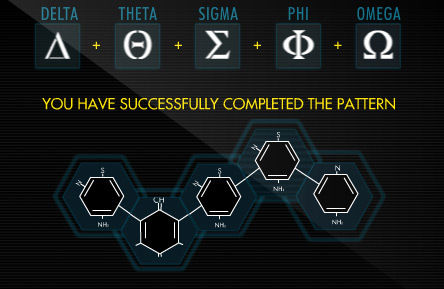 There is also a very simple "Pattern Test", which if you complete (i.e. Complete The Pattern...), you will get five more entries into the sweepstakes. I am completely outraged that Canadians can not participate in the contest or even have access to downloadable content or a sneak peak. I mean, Fringe is being filmed in Vancouver...but why not let the world have access to the site without having to enter the contest???? As a huge Fringe Fan, this is definetly a negative setback! We go through this every time there is a contest, but there are probably too many legal issues/problems to have contests available worldwide. Ah thank you Very much for putting up the downloads and video!!! I feel a lot better now :-). Thank you for putting the download links. In FF I was able to click them, but only a blank tab would open. Though, I don't really like how the answers were posted. CTV Contest people. They could exclude all of the Yanks from playing in their contest. It's an American production, you doofs. Just be happy that we're sending you guys the business. thanks so much, but I can't open the screensaver zip... any help?